Apogee is an award-winning industry leader in digital recording technology with over 25 years of experience. Preferred by recording pros around the world, Apogee products like Duet, Ensemble and Symphony I/O have been instrumental in creating countless GRAMMY® and OSCAR® winning recordings and have set the industry standard in professional recording for over two decades. 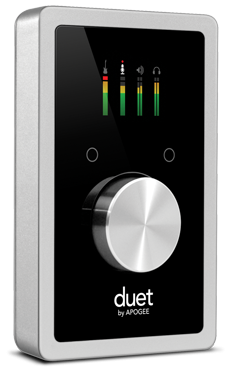 Duet is built solidly on this reputation. 2 analog inputs with world-class mic preamps and selectable 48v phantom power for connecting microphones, instruments or line-level devices. 4 analog outputs – 2 balanced 1/4” mono outputs for speakers or outboard gear, 1/4” stereo headphone output. USB 2.0 High Speed connection to Mac. Direct digital connection to iPad and iOS devices (iPhone, iPad and iPod touch. Lightning and 30-pin cable sold separately).